New SunStar Patio Heater Provides a Circle of Warmth for Outdoor Areas When Cooler Temperatures Arrive - SunStar Heating Products, Inc.
CHARLOTTE, North Carolina — SunStar® Heating Products of Charlotte, N. C. has introduced a new, heavy duty infrared patio heater in a sleek stainless steel (Type 304) finish or in a black and silver textured painted finish for year around comfort and heating efficiency for both residential and light commercial applications. The attractive and fully portable SunStar® Patio Heater operates without electricity and has a powerful 40,000 BTU/hr rating. This makes it ideal for many outdoor environments during periods of cooler temperature. Uses include home patios and outdoor work areas or light commercial environments such as outside seating in restaurants, bars or hotels, leisure areas around pools or golf courses, and outdoor smoking areas. UL-listed and safety certified, the new heaters provide a full 360 degree circle of heat, uniformly distributed to provide a circle of warmth up to 20 feet in diameter. For added safety, the base is weighted to help prevent tipping during strong winds or inclimate weather. A robust wheel kit fastened to the base comes standard and allows for easy maneuverability and placement on the patio or for simple storage when not in use. Unique to the industry are four cup holders located on the cylindrical cover, each of which holds up to a 32 oz. cup or beverage. A protective vinyl cover is also available as an accessory for storage. Each heater includes a Piezo Spark Ignition System for instant start-up without matches as well as a Flame Feature Safety Device that is designed to turn off the gas in case of flame failure. 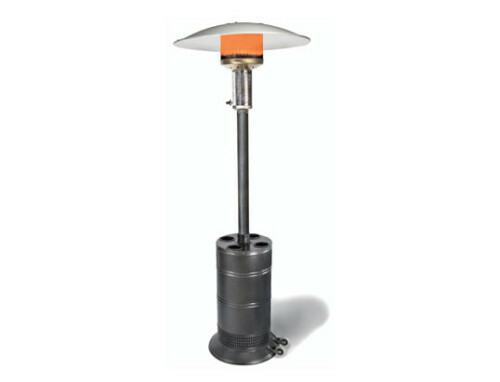 High quality materials underscore the heavy duty construction of the new SunStar patio heater. Included as standard are all brass fittings, a stainless steel burner assembly, and even heavy gauge stainless steel fasteners. The heater accepts a standard 20 lb gas cylinder that is easy to install by simply lifting the base of unit. Cylinders can be filled at local outlets that also service tanks in outdoor grilles. The unit weighs 64 lbs and is 89 in. tall. Reflector diameter is 34 in. The new SunStar® Patio Heater is sold through rental, hardware, plumbing, heating, fireplace and gas equipment wholesale trades throughout the U. S. and Canada. According to Frank Horne, Jr., President of SunStar Heating Products, Inc., the new durable patio heater extends the season by letting you use the outdoor environment longer. “The weather resistant construction of the new SunStar patio heater and its mobility and heating efficiency make these heaters the ideal choice to warm up those cooler evenings,” noted Horne. “The heaters are virtually 100 percent efficient and offer uniform heat distribution in an area up to 20 feet in circumference for comfort and enjoyment,” he noted. The SunStar patio heater operates on the radiant heat principle that warms people and objects directly without heating the air first. This principle is similar to the suns heat energy, heating the earth’s surface but not the upper atmosphere. SunStar Heating Products was founded in 1987 as a wholly-owned subsidiary of Gas-Fired Products. Besides patio heaters, SunStar offers a complete line of radiant and blue flame type vent-free gas room heaters, garage heaters, infrared gas heaters and construction site heaters. 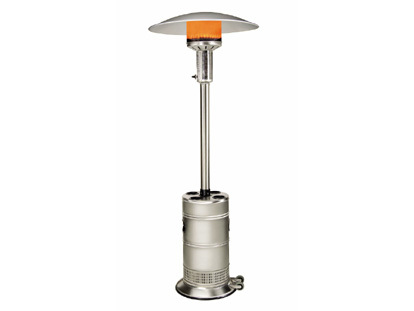 For more information on the SunStar® Patio Heater, contact SunStar Heating Products, Inc., 306 W. Tremont Avenue, P. O. Box 36271, Charlotte, N. C. 28236 or telephone (704) 372-3486 or 1-888-778-6782, Fax is (704) 332-5843 or E-mail info@sunstarheaters.com. SunStar can also be found on the web at www.sunstarheaters.com. The new heavy-duty SunStar® Patio Heater from SunStar® Heating Products of Charlotte, N. C. has a powerful 40,000 BTU/hr rating making it ideal for outdoor environments during periods of cooler temperature. It is available in a sleek stainless steel (Type 304) finish (shown above) or black and silver textured painted finish. The heater is ideal for use on home patios and outdoor work areas or light commercial environments such as outside seating in restaurants, bars, hotels, leisure areas such as swimming pools or golf courses and outdoor smoking areas as well as many other applications. The attractive and fully portable SunStar® Patio Heater from SunStar® Heating Products of Charlotte, N. C. provides a full 360 degree circle of heat, uniformly distributed to provide a circle of warmth up to 20 feet in diameter. Shown above is the black and silver textured painted model.